UFO SIGHTINGS DAILY: Evidence That Alien Overlord Has Control Of The USA Economy and Government, UFO Sighting News. Evidence That Alien Overlord Has Control Of The USA Economy and Government, UFO Sighting News. 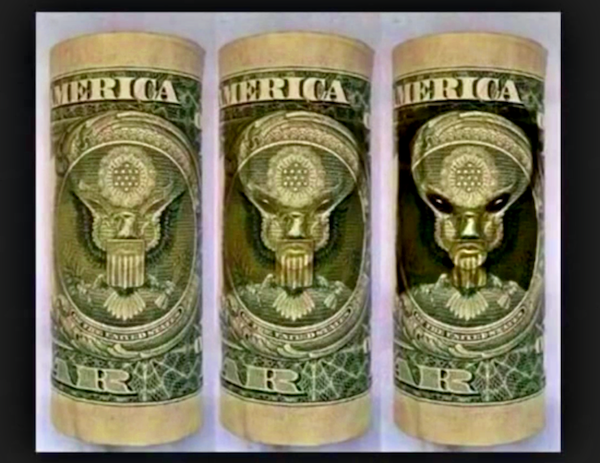 Aliens have placed secret messages in our own currency. Some say you have to draw the alien, but thats not true. If you just add contrast (shadow) to the original, it will turn into the alien head. Alien art is suppose to be outside the realms of our comprehension, made not on one level like human art, but many levels of understanding, making most too complex for our primitive minds. There are secret signs all around us, that aliens have been controlling our destiny, controlling the direction humanity is taking for their own benefits. With the visible letters MERICA at the top, may mean Me Rica, the name of a specific alien overlord.